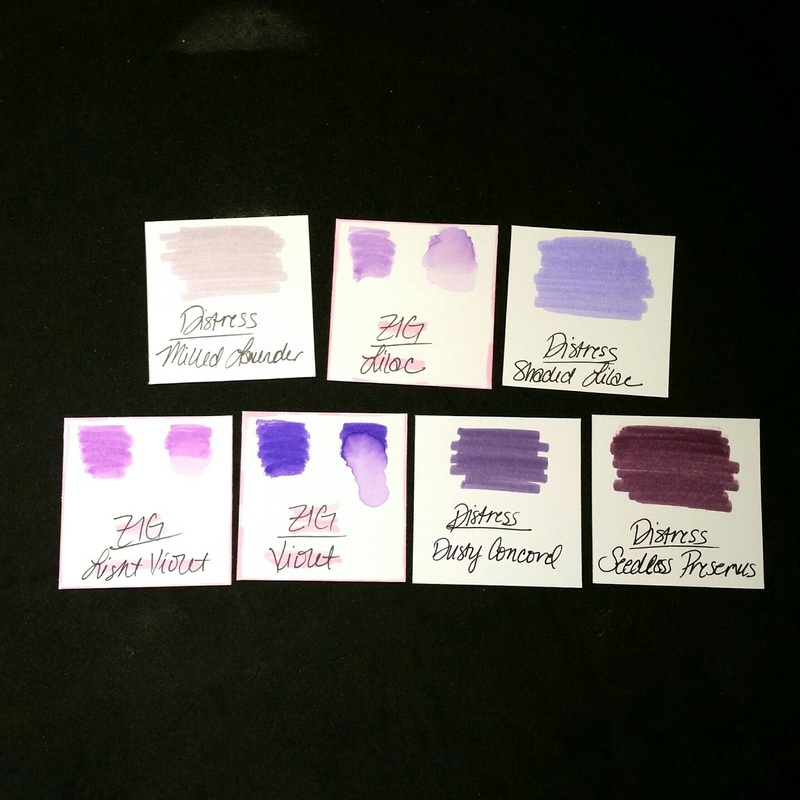 Where do the Zig Clean Color pens fit in the Distress palette? I just received my first order of the Zig pens, and I’m already in love. What everyone has been saying is completely true: the blend is gorgeous, with or without water. 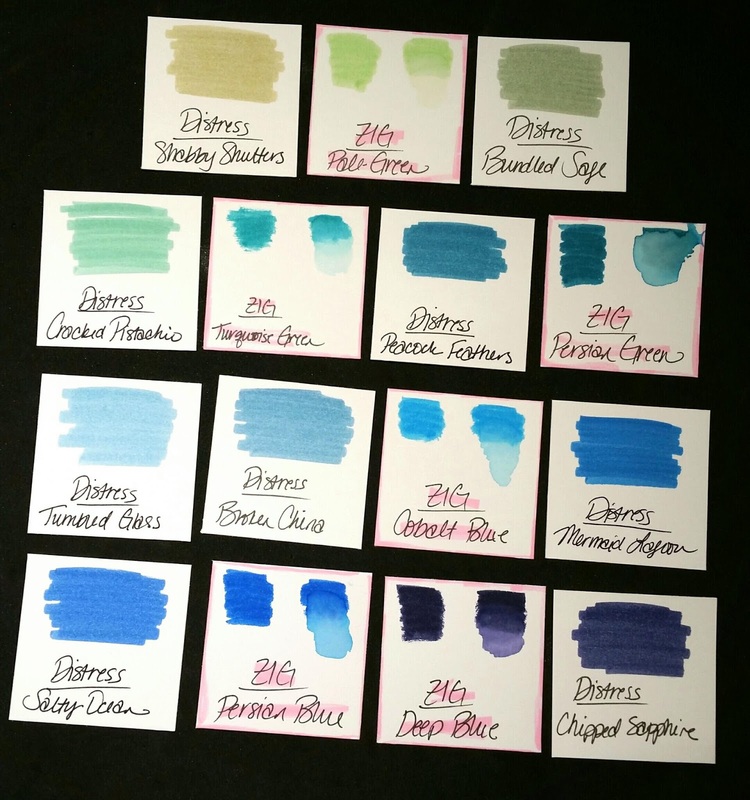 Now, I hesitated to order these, because I wasn’t sure whether I truly *needed* them, since I have and love my distress markers, but I thought I would get some to fill in holes in my distress palette. Tim Holtz, for all of his wonderfulness, is still just a man, so pinks and purples are just not his thing. I focused mainly on those two colors with my Zig order, adding in some blues and a green. 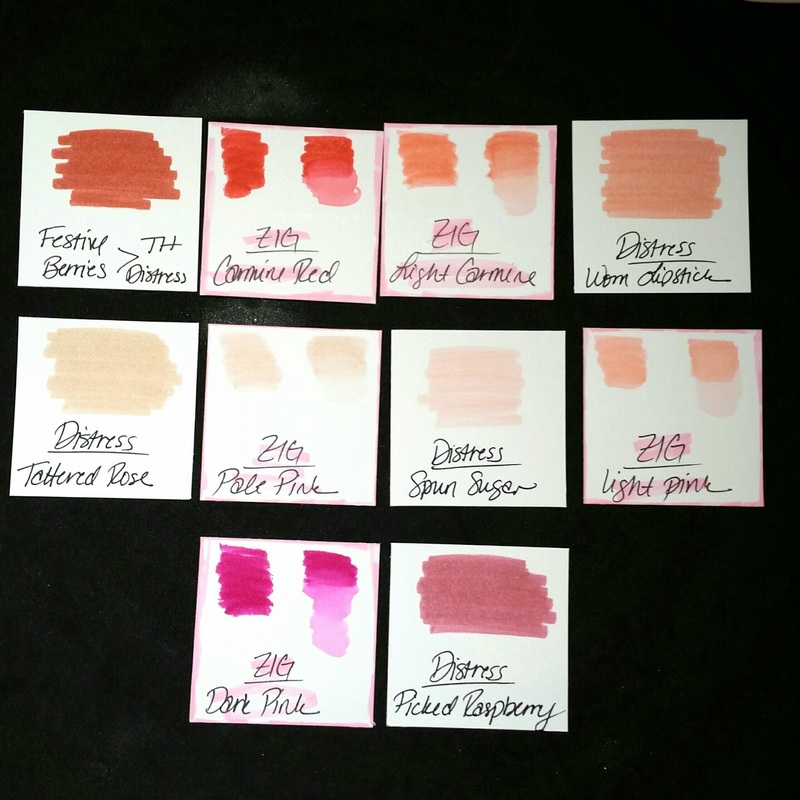 I did my swatches for my Jennifer McGuire swatch book, and I thought I would share with you how the Zig pens fit in the TH palette. Thus far, I am extremely pleased with my purchase, as the Zig pens are very bright and vibrant, an attribute I find to be lacking in the more muted Distress palette. I have shared the photos I snapped below. I don’t have every single distress marker, but I have quite a few, and these zig markers will round or my collection nicely. I have highlighted the color and around the edge of the Zig swatches to make them easier for you to distinguish. I hope you find these photos helpful if you are on the fence or were curious about the colors in comparison. I can’t wait to play with these some more!! If you have questions, please feel free to ask, and I will do my best to get back with you quickly!! We are off to celebrate the 2nd birthday of a little princess this weekend, so I will get back to you as quickly as I can.